It's one of those beautiful, early spring days when the first thing you want to do is open all the windows to let the fresh air in and let the stale, winter air out. I put together a bright and lively fragrance blend for this unusually warm day: Aquiesse French Oak Currant, DayNaDecker Amara and Voluspa Coeur de Cassis. This pungent blend is invigorating and refreshing. 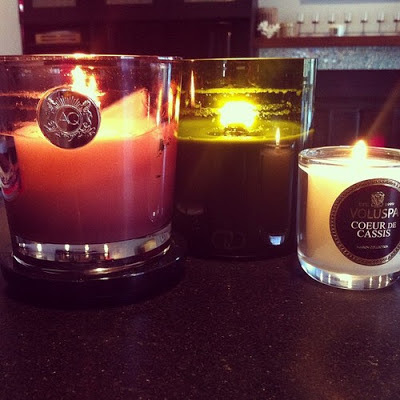 What fragrances do you use to breathe new life into your home? These look amazing. I just love scented candles with that perfect fragrance smell. What is the Voluspa Coeur de Cassis scent like. Voluspa Coeur de Cassis is very lively and full of character. It's slightly pungent but smooth. If you like Votivo Red Currant or Seda Japanese Quince this is a good one to try.